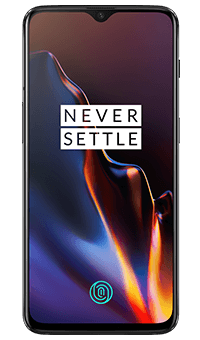 Delve into a world of pioneering technology – the OnePlus 6T fuses an in-screen fingerprint sensor, impressive screen and improved cameras into a delicately designed phone. Forget reaching for the fingerprint sensor on the back – the OnePlus 6T boasts a cutting-edge, in-screen fingerprint scanner. With the most up-to-date sensor of the industry, unlocking your phone has never been this quick and easy. The OnePlus 6T sports a slim frame with a smart-arc backing crafted at the micron-level to fit your hands perfectly. With an even thinner bezel and a significantly smaller notch, the OnePlus 6T will dazzle you with its exceptional design. Let the OnePlus 6T deliver a performance for the ages – run your apps with ease and manage your daily tasks without any interruptions. Reach the next level of mobile entertainment when you play the hippest games in crisp definition and at terrific speed. The OnePlus 6T's camera just got smarter – use Quick Capture to snap photos in an instant while the phone chooses the perfect setting for your picture. Take selfies with more depth thanks to Portrait Mode, and capture action in HD with super slo-mo. Picture a phone with an AMOLED screen like you've never seen before. The OnePlus 6T comes with a stunning 86% screen-to-body ratio and Corning Gorilla Glass 6 to elevate – and protect – your viewing experience.